What is Terramycin Ophthalmic Ointment (Oxytetracycline Hydrochloride) used for? 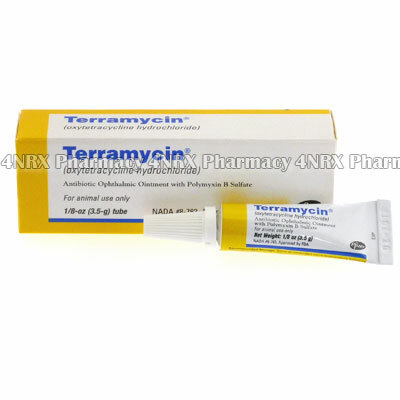 Terramycin Ophthalmic Ointment (Oxytetracycline Hydrochloride) is an ophthalmic antibiotic used to treat bacterial infections affecting the eyes of dogs, cats, or horses. The medication destroys and slows the reproduction of bacteria cells allowing the immune system to completely eliminate the infection. It should be noted that this medication is only useful for treating bacterial infections and will have no effect on those caused by a virus or fungus. The veterinarian may prescribe this medication to be used along with others or for the treatment of other unlisted conditions. How should I use Terramycin Ophthalmic Ointment (Oxytetracycline Hydrochloride)? Terramycin Ophthalmic Ointment (Oxytetracycline Hydrochloride) is normally administered once or twice each day to the affected area, but your individual instructions will be determined by your age, weight, current health, the condition being treated, and the severity of your symptoms. The ointment is administered by removing the cap, gently pulling down the lower lid of the affected eye, administering a thin layer of medication to the pocket formed, and slowly closing the eye to spread the medication over the surface of the eye. You are suggested to keep the eye closed for twenty to thirty seconds to allow the medication to be absorbed. Do not allow the tip of the applicator to touch any foreign surfaces including the surface of the eye as this may cause contamination. Always wash your hands using soap and water after each application to prevent the ointment from contacting any areas not being treated or other mucous membranes. Always ask your physician any questions you have about using the medication to ensure the correct administration. What are the side effects of Terramycin Ophthalmic Ointment (Oxytetracycline Hydrochloride)? Stop using the medication and contact your physician as soon as possible if any serious or worrying side effects occur such as severe eye pain, crusting or discharge, headache, intense burning sensation, or signs of an allergic reaction such as hives, skin rashes, swelling, or difficulty breathing. These conditions may require reduced application frequency or immediate medical attention in serious or life threatening cases to prevent further health problems from occurring. Terramycin Ophthalmic Ointment (Oxytetracycline Hydrochloride) is only meant to treat eye infections and should not be used internally. Do not use this medication if you are allergic to its contents or if you have any disorder of the eye lens such as an artificial lens or if the lens has been removed. You are also recommended to have a medical check before beginning use to ensure you do not have any other medical problems that may cause unexpected health complications. Strictly follow all instructions provided to you by your physician or pharmacist while using Terramycin Ophthalmic Ointment (Oxytetracycline Hydrochloride). Optimum and safe dosage can differ based on the patient and the condition being treated.